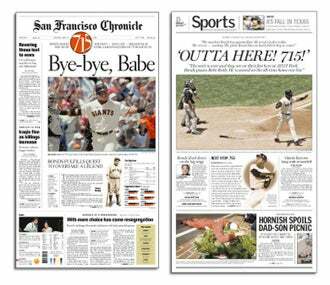 Given the state of the newspaper business in the Bay Area and the relative interest in hockey there, I'm surprised this hasn't happened sooner: Hockey reporters Ross McKeon of the San Francisco Chronicle and Victor Chi of the San Jose Mercury News are no more. (Well, they're still alive.) The Chronicle bought out McKeon's contract last week, and Chi was laid off on Monday. The latter was part of a purge of 31 San Jose Mercury News employees. This doesn't mean that hockey will be dispatched to no-man's land or limited to wire service coverage in the Bay Area, at least not yet. The Mercury, for example, had two hockey writers covering the San Jose Sharks, and one of them, David Pollak, will continue in that role. No, this is much less a comment on hockey than it is on the shrinking media job market in the Bay Area, where the two largest dailies will lop up to an estimated 160 jobs before the summer is over. The San Jose Mercury News is owned by MediaNews Group, whose founder and executive officer, Dean Singleton, is known for slash-and-burn consolidation tactics (euphemistically called "clustering"). It's bad in almost every way; I know. I used to work for one of his papers. It was not an enriching experience, and I left of my own accord, but I could also see the writing on the wall. And the Chronicle is little better off. Even though SFGate.com is one of the most vibrant news sites in the country, it has done little to help the finances of the Chronicle under the Hearst Corp., which bought the paper in 2000. The Chron is hemorrhaging dollars, and not only will this effect hockey coverage, but that of soccer and Arena Football and other "fringe" sports as well. This is an insane set of circumstances, considering that the Bay Area has one of the highest tax bases in the nation; the average three-bedroom house in many communities going for close to $1 million. The advertising revenue is out there ... there's just something terribly wrong with the way the big newspapers are structured. Oh yeah, this post was supposed to be about hockey. But actually, our nation's frozen pastime has very little to do with the problem.